Check out today's prep team spotlight on the Plaquemine Green Devils, which is a team that is trying to capture their fifth district championship in seven years under Head Coach Paul Distefano! Check out today's prep team spotlight on the Ascension Episcopal High School Blue Gators as they get ready for district play after an impressive 5-1 start! Check out today's prep team spotlight on the McDonogh 35 Roneagles who are trying to get back in contention for a Class 4A State Championship even with the number of senior playmakers that graduated from the year before! 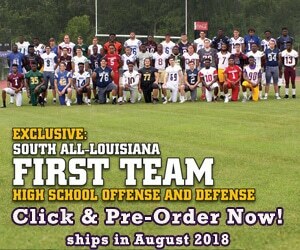 Check out today's prep team spotlight on the Carencro Golden Bears as the team tries to find their groove after a 1-4 start in their first five games!